Aluminum Stack Jacks-Better Products Co.
1) 6,000 pounds load capacity. 2) More than 10,000 pounds load capacity (the strongest model in the market). · Screw extends from 11" to 17". · Textured Finish, No Sharp Edges. · Base to top-of-swivel position is 11" high. · Heavy-duty, non-corrosive cast aluminum base. · Get secure and level RV positioning and stability. · Permanent and fully adjustable handle with each jack. · These stacking camper jacks measure approximately 8 3/4" x 6 1/4". 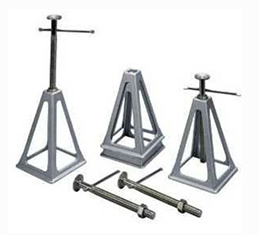 · They are used for stabilizing, not for lifting, and not for full vehicle support.